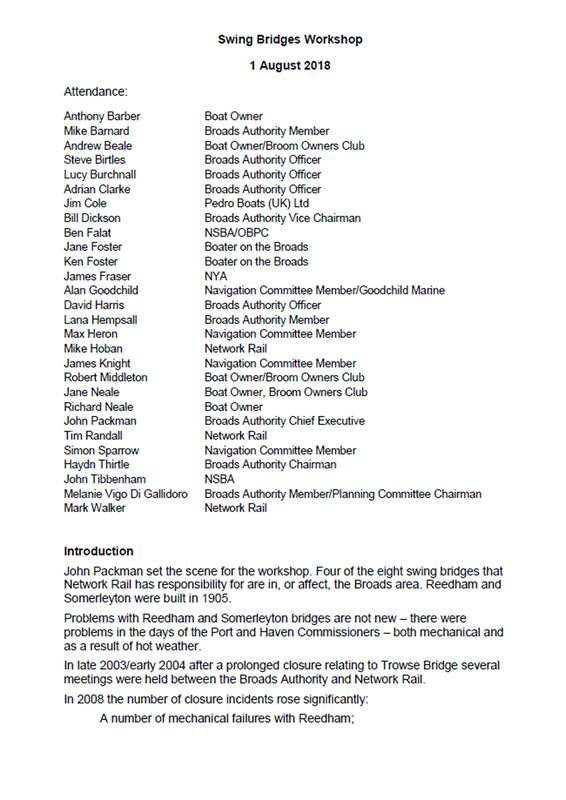 Please find attached a copy of the notes summarising the presentations and discussion at the workshop on swing bridges held on 1st August. You will see that they include a list of 9 actions which has been agreed with the engineer from Network Rail.
? Discussed the multi criteria analysis for Reedham and Somerleyton. There is a 5 year finance budget; the bridges will be treated as major structures. The total cost for replacement of these structures is ?80 million. This is in the context of a total 5 year budget of ?160 million for the 6,000 structures across the region. As a result Network Rail is commissioning the preparation of asset management plans to make the case for separate funding and these are expected to be completed by March 2019. Thank you, JP, but there is no attachment. Perhaps the notes could be uploaded to the BA web site and a link provided on here. Or, if you could email them to me, I will put them into a format that can be posted here. I tried to upload the notes but it would not accept them - just received an error message. Thanks for the offer - can you send me an email john.packman@broads-authority.gov.uk and I will send them to you. Thank you, JP. Email sent. These are the notes sent to me by JP, which I have converted to 'jpg files, as that is the only file format this site accepts now as attachments. There are 5 files. I realise that having to split the notes into five files doesn't make for easy reading, so I've extracted the text, reformatted it and it is shown below. John Packman set the scene for the workshop. Four of the eight swing bridges that Network Rail has responsibility for are in, or affect, the Broads area. Reedham and Somerleyton were built in 1905. Problems with Reedham and Somerleyton bridges are not new – there were problems in the days of the Port and Haven Commissioners – both mechanical and as a result of hot weather. In late 2003/early 2004 after a prolonged closure relating to Trowse Bridge several meetings were held between the Broads Authority and Network Rail. Consequently in August 2008 the Broads Authority sought legal advice from Norfolk County Council’s solicitors. May 2010 Network Rail informed the Authority of a bearing failure at Somerleyton and a new bearing would have to be fabricated. Replacement occurred late June/early July and on 4th July the bridge was brought back into operation. On 14th July catastrophic failure of the bearing occurred. This was quickly replaced but swinging on a limited basis. Later that year Network Rail funded the provision of pontoons at the bridges and subsequently electronic signage. Since then Network Rail has commissioned two major studies on future options for the replacement or refurbishment of the two bridges by Mott MacDonald.
. Discussed how Network Rail works: how failures and faults are logged.
. Network Rail’s priority is for rail services.
. Technology involved with the bridges is simple; however there is a long term process in order to change the requirements. Swing bridges in particular are a very niche area.
. Discussed the thermal expansion gaps and the requirements for swing bridges.
. Discussed the effects of the bridges in regards to high temperatures. 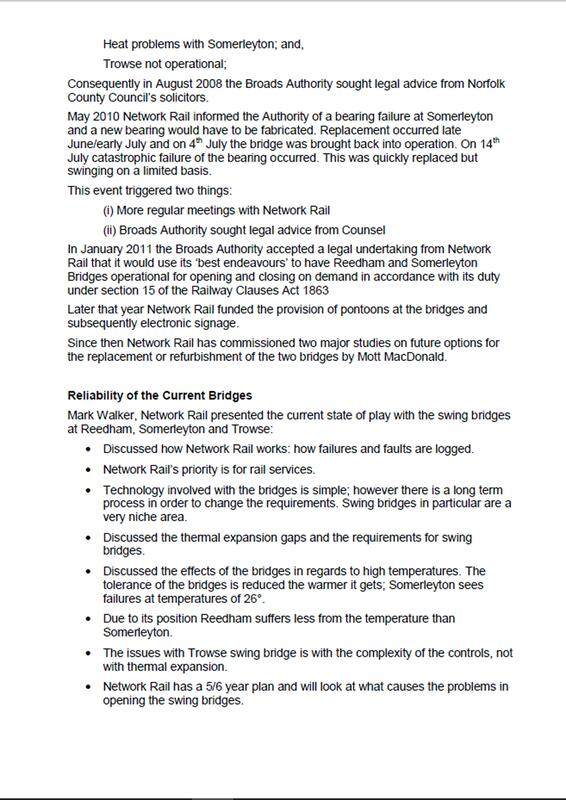 The tolerance of the bridges is reduced the warmer it gets; Somerleyton sees failures at temperatures of 26°.
. Due to its position Reedham suffers less from the temperature than Somerleyton.
. 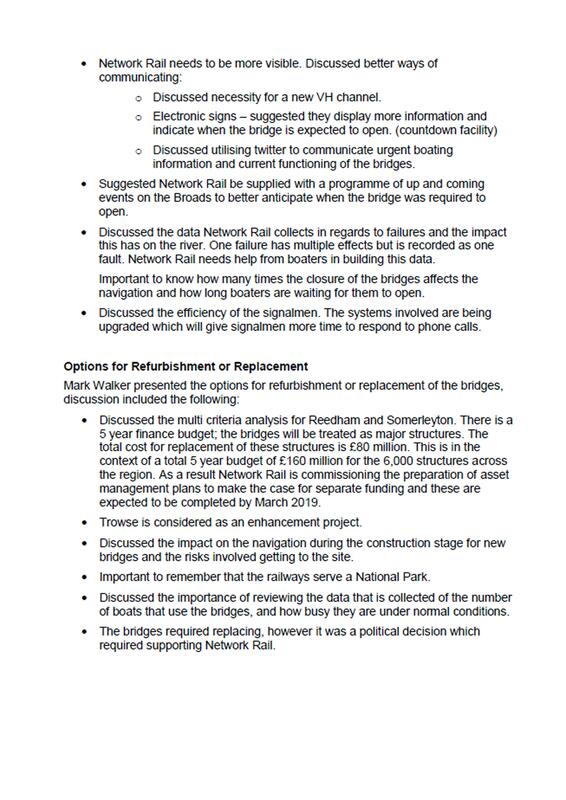 The issues with Trowse swing bridge is with the complexity of the controls, not with thermal expansion.
. Network Rail has a 5/6 year plan and will look at what causes the problems in opening the swing bridges.
. The replacement of the bridges is a funding issue. In terms of reliability the bridges are limited by the technology. James Frazer, Norfolk Yacht Agency discussed the impact of unreliable opening on businesses. 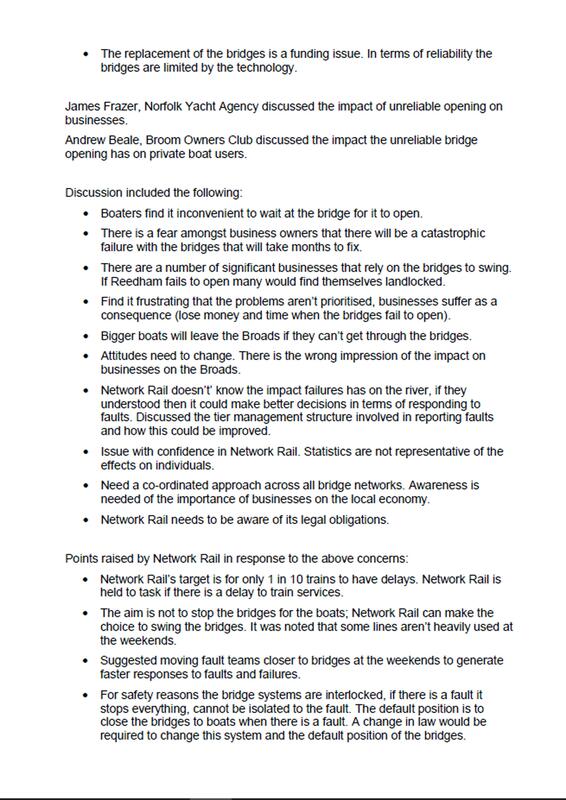 Andrew Beale, Broom Owners Club discussed the impact the unreliable bridge opening has on private boat users.
. Boaters find it inconvenient to wait at the bridge for it to open.
. There is a fear amongst business owners that there will be a catastrophic failure with the bridges that will take months to fix.
. There are a number of significant businesses that rely on the bridges to swing. If Reedham fails to open many would find themselves landlocked.
. Find it frustrating that the problems aren’t prioritised, businesses suffer as a consequence (lose money and time when the bridges fail to open).
. Bigger boats will leave the Broads if they can’t get through the bridges.
. Attitudes need to change. 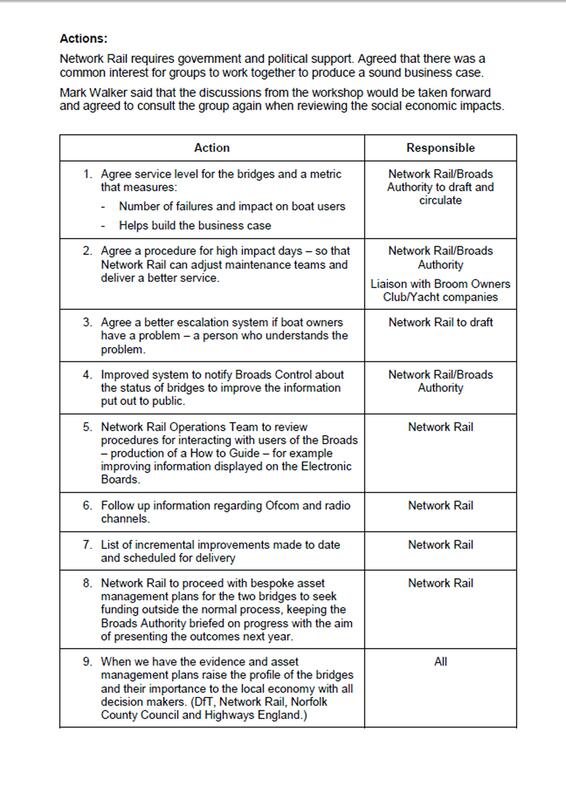 There is the wrong impression of the impact on businesses on the Broads.
. Network Rail doesn’t’ know the impact failures has on the river, if they understood then it could make better decisions in terms of responding to faults. Discussed the tier management structure involved in reporting faults and how this could be improved.
. Issue with confidence in Network Rail. Statistics are not representative of the effects on individuals.
. Need a co-ordinated approach across all bridge networks. Awareness is needed of the importance of businesses on the local economy.
. Network Rail needs to be aware of its legal obligations.
. Network Rail’s target is for only 1 in 10 trains to have delays. Network Rail is held to task if there is a delay to train services.
. The aim is not to stop the bridges for the boats; Network Rail can make the choice to swing the bridges. It was noted that some lines aren’t heavily used at the weekends.
. Suggested moving fault teams closer to bridges at the weekends to generate faster responses to faults and failures.
. For safety reasons the bridge systems are interlocked, if there is a fault it stops everything, cannot be isolated to the fault. The default position is to close the bridges to boats when there is a fault. A change in law would be required to change this system and the default position of the bridges.
. Discussed necessity for a new VH channel.
. Discussed utilising twitter to communicate urgent boating information and current functioning of the bridges. Suggested Network Rail be supplied with a programme of up and coming events on the Broads to better anticipate when the bridge was required to open. Discussed the data Network Rail collects in regards to failures and the impact this has on the river. One failure has multiple effects but is recorded as one fault. Network Rail needs help from boaters in building this data. Important to know how many times the closure of the bridges affects the navigation and how long boaters are waiting for them to open. Discussed the efficiency of the signalmen. The systems involved are being upgraded which will give signalmen more time to respond to phone calls.
. Discussed the multi criteria analysis for Reedham and Somerleyton. There is a 5 year finance budget; the bridges will be treated as major structures. The total cost for replacement of these structures is £80 million. This is in the context of a total 5 year budget of £160 million for the 6,000 structures across the region. As a result Network Rail is commissioning the preparation of asset management plans to make the case for separate funding and these are expected to be completed by March 2019.
. Trowse is considered as an enhancement project.
. Discussed the impact on the navigation during the construction stage for new bridges and the risks involved getting to the site.
. Important to remember that the railways serve a National Park.
. Discussed the importance of reviewing the data that is collected of the number of boats that use the bridges, and how busy they are under normal conditions.
. The bridges required replacing, however it was a political decision which required supporting Network Rail. Network Rail requires government and political support. Agreed that there was a common interest for groups to work together to produce a sound business case. Mark Walker said that the discussions from the workshop would be taken forward and agreed to consult the group again when reviewing the social economic impacts. 2. Agree a procedure for high impact days – so that Network Rail can adjust maintenance teams and deliver a better service. 3. Agree a better escalation system if boat owners have a problem – a person who understands the problem. 4. Improved system to notify Broads Control about the status of bridges to improve the information put out to public. 5. Network Rail Operations Team to review procedures for interacting with users of the Broads – production of a How to Guide – for example improving information displayed on the Electronic Boards. 6. Follow up information regarding Ofcom and radio channels. 8. Network Rail to proceed with bespoke asset management plans for the two bridges to seek funding outside the normal process, keeping the Broads Authority briefed on progress with the aim of presenting the outcomes next year.